Daniel Ackermann, born in 1976, received his first musical education at the age of seven on the piano. Two years later he dicovered his passion for the trumpet. 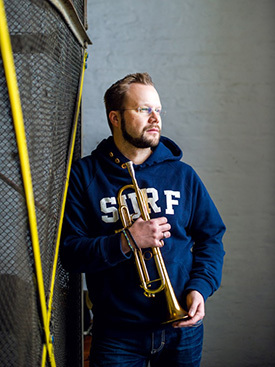 In 1994, during his late school days, he started already studying the trumpet at the Peter-Cornelius-Konservatorium Mainz with Prof. Malte Burba. 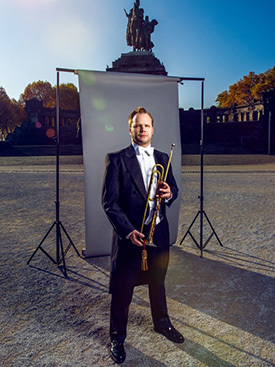 While this period, till 1999, Ackermann has toured with the Europeen Youth Symphonic Wind Orchestra (1996 &1998), played first solo performances with organ and piano, made a course at Villa Musica and worked with the Landes-Jugend-Ensemble für Neue Musik - Rheinland-Pfalz. In 1999 he changed to the State Academy of Music Cologne. Until 2004 – that same year successful examination of his studies with Prof. Urban Agnas – he made non university studies and masterclasses with Prof. James Thompson(Eastman School of Music New York), Prof. Jens Lindemann (University of California), Michael Sachs (Cleveland Orchestra), Manfred Bockschweiger (Staatstheater Darmstadt), Friedemann Immer (Musikhochschule Köln), Gabor Tarkövi (Berliner Philharmoniker), Prof. Matthias Höfs (Musikhochschule Hamburg and Prof. Reinhold Friedrich (Musikhochschule Karlsruhe). Daniel Ackermann played/plays with various orchestra such as theatre Trier, Opera Cologne, Orchesterakademie Nordrhein-Westfalen, L'Orchetre des Jeunes de la Grande Region, Klassische Philharmonie Bonn, Rheinische Philharmonie Koblenz, Württembergisches Kammerorchester, WDR-Funkhausorchesterder, Deutsche Bläserphilharmonie and Bläserphilharmonie Süd-West. Solo concerts with several orchestras (for example Sinfonietta Mainz or Dvorak-Symphony Orchestra Prag) just as repeatedly with organ and piano (for example at the Mosel-Musik-Festival), enrich also his musical work as well as cooperations with different brass ensembles or excursions in Jazz and Rock&Pop music for example with Thomas Anders, Sahne-Mixx, Django-Reinhardt & Band, Menino or the MJ-Big-Band. In 2006 Ackermann got a scholarship of the Richard-Wagner Verband and completed his Studies until 2007 at the Conservatoire de la Musique Luxemburg with Roman Zaremba. He played/plays concerts through Europe and the USA. Daniel Ackermann started to teach children and youths very early and completed his pedagogic skills with his music pedagogic studies. At present he works as a teacher at the music school Klangwerk in Neuwied. Here he gives lessons in trumpet, euphonium, horn as well as didgeridoo and some of his students already won prizes in the german Jugend Musiziert music-competition and played/are playing in several orchestras. Daniel Ackermann also gave/gives workshops for orchestras or the Landesmusikakademie Rheinland-Pfalz. 2008-2015 he was teacher for Trumpet at the University of Koblenz. 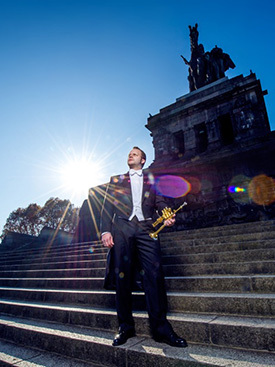 Daniel Ackermann teaches amongst others the method of Prof. Malte Burba and is licensed Burba®BrassTeacher and member in the Burba®BrassNetwork.